Joe Wedge took these pictures Friday evening, and forwarded them to my Twitter account (@timothygwyn) today. 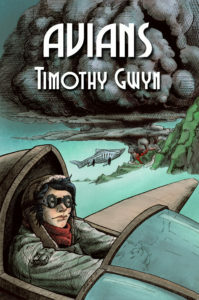 This first one is Ptarmigan Bay. Joe says it’s completely ice-free there. Joe tells me this is Ady Island. The photo looks north, so that must be Copper Island in the background. The second shot is of Shoal Lake, looking south towards Spike Point. That places the photo at the east end of Shoal Lake, by Carl Bay. Keep in mind that these pictures were taken two days ago. I don’t have a picture from her, but Ashley Kolisnik went flying today and sent me a text update through the comment form. 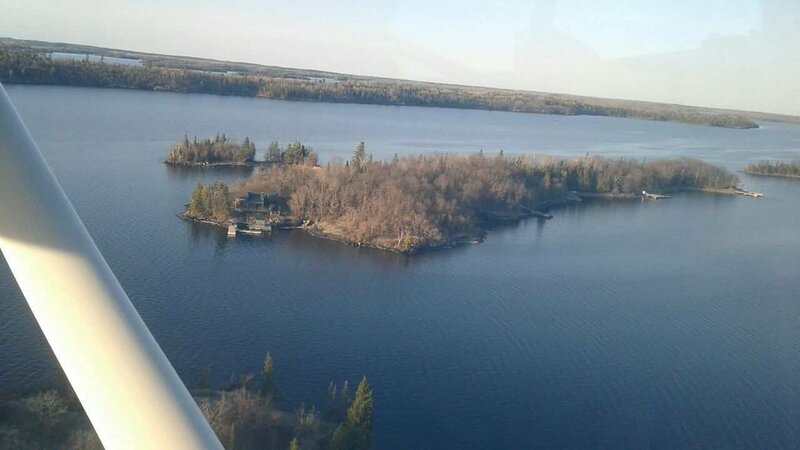 In case you missed it, she says Lake of the Woods is 99% ice free as of Sunday afternoon. 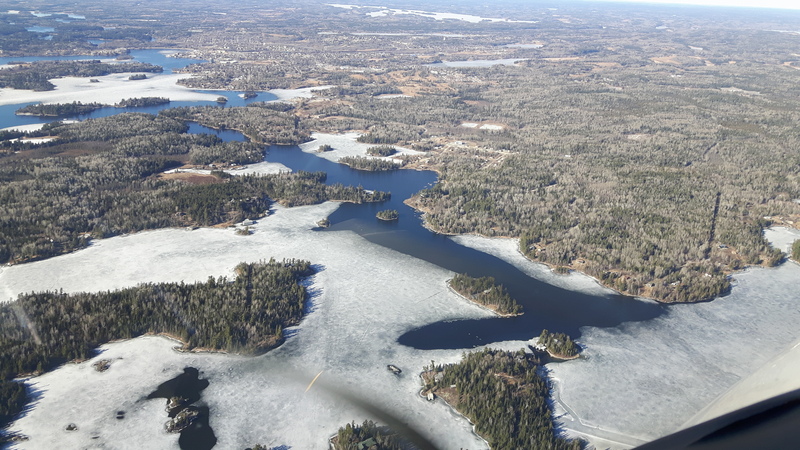 She found only a little patch of ice south of French Narrows, down by Butterfly Island, and she estimates it as half a mile long and about as wide. It has been wonderful to see so many people contributing to the Ice Patrol this year. I’m supposed to go flying tomorrow, and I hope to be able to get a look at the lake then. However, there is a forecast for a significant snowfall starting Monday and worsening through the afternoon and evening, so the weather may not cooperate. 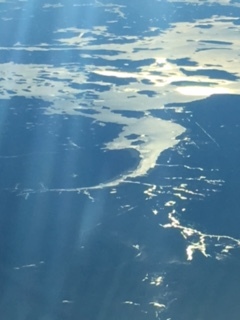 We came home in afternoon sunlight today, and approached Kenora from the south east. This picture looks north, with Silver Lake in the distance. It’s all ice out that way. Click on these pictures to see a larger, high-res version that is zoomable. We didn’t go over Sioux Narrows, but we got close enough to see Whitefish Bay. Whitefish Bay, Long Bay, Yellow Girl Bay. 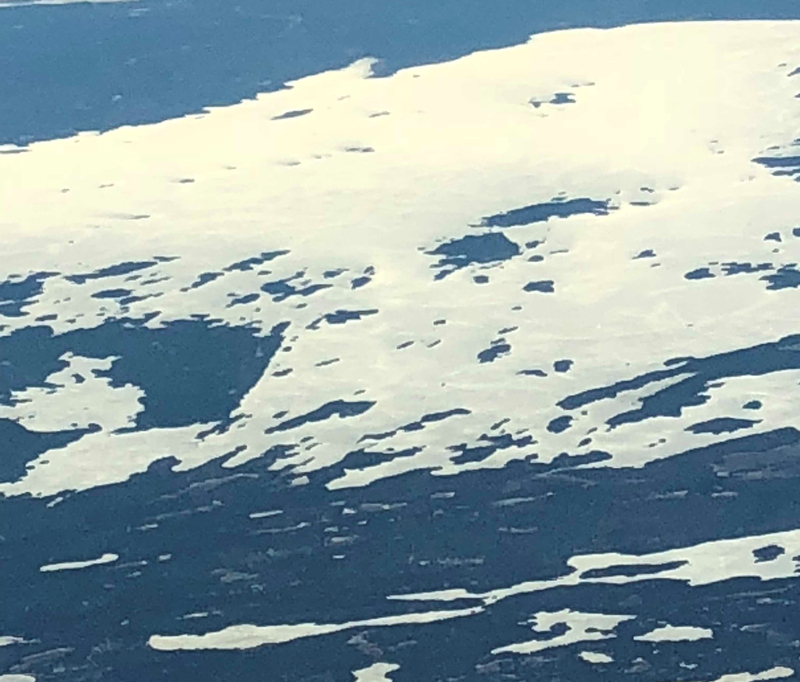 If you click on this picture and zoom in, you can make out a little open water at Whitefish Narrows. Off in the distance, the Big Traverse is still frozen. Now that we’ve established that there are vast expanses of ice, let’s get back to my preference for taking pictures where the water is. This picture looks west at the open water at the Elbow. East Allie Island is in front of the wing, then Allie Island, and beyond the water are Mathis Island and Shammis Island. The biggest expanse of open water is still Keewatin Channel. 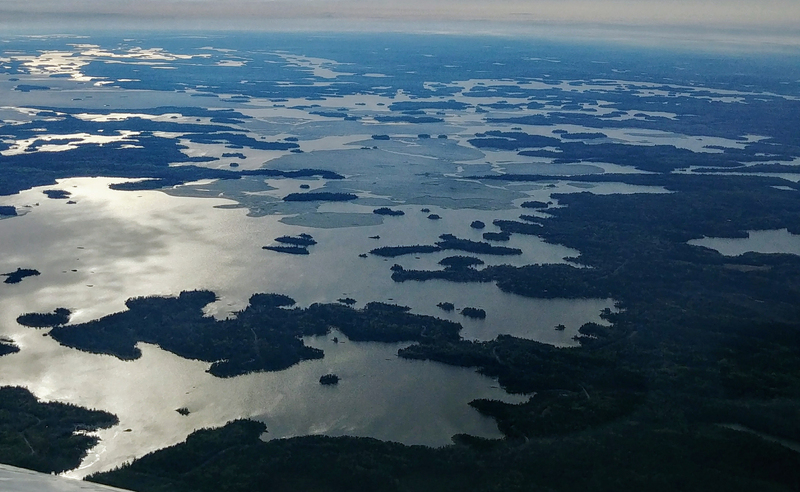 The picture above was taken from over Middle Island. Scotty Island and the distinctive Scotty’s Beach are at the lower left. Just above that, you can see that water is lapping at Anchor Island now. Last, a closer look at the passage through Devil’s Gap. Kenora is in the distance at the left in this shot that looks north. You still couldn’t really go very far through the Gap by boat, but you could make it to Nickerson Island, and Galt will be reachable soon. That’s about it for my photos today, but Matthew Render snapped a few shots from his Air Canada A320 as he flew by at 37,000 feet. These are not zoomable. Matthew probably sent them straight from his smartphone. First, Shoal Lake. All ice, except a little patch at the left edge. This shot looks east, so you can see Clearwater Bay, Ptarmigan Bay and that area in the background. Looks like there’s some water at the North West Angle. Thanks, Matthew. I’ve been holding off on really starting work on the Ice Patrol this year because Kenora has been very cold for the last week or so. The ice has been getting thicker, not thinner. 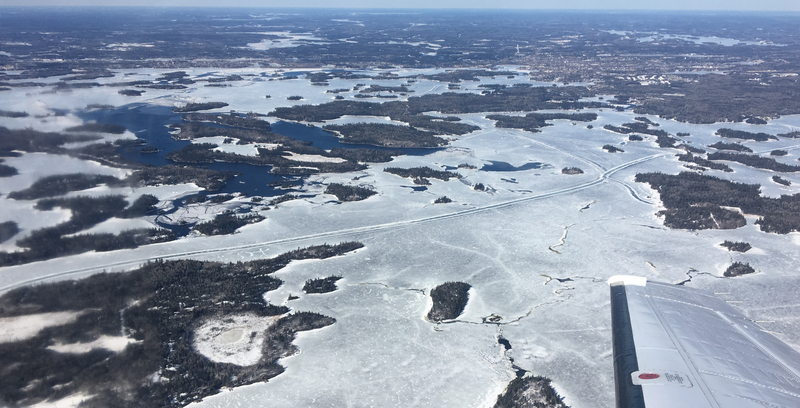 But hey, it’s the middle of March, so when the opportunity to fly over Lake of the Woods came up today, I grabbed some pictures. Don’t get your hopes up. There’s a lot of ice out there. In fact, I had to look hard to find any open water at all. The picture above looks north from a position over Anchor Island. 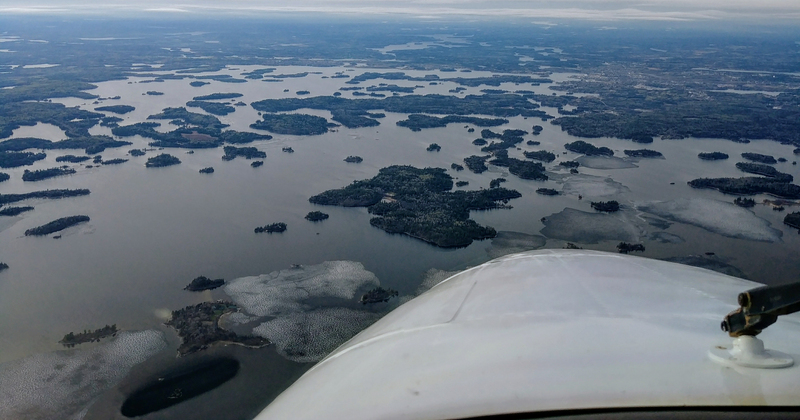 Town Island is just above the wingtip, and above that you can make out Kenora’s downtown. Don’t forget, you can click on these pictures to see a larger version. 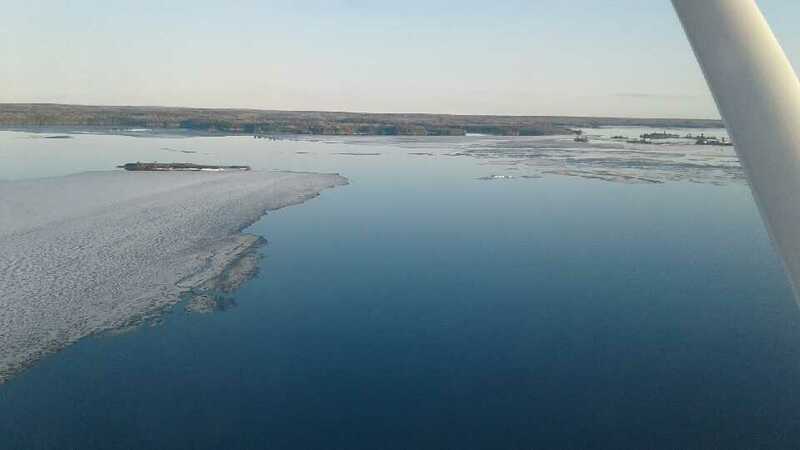 At the left of this photo, you can see a little open water in the Keewatin Channel, but it doesn’t connect to anything yet. It’s common to find a stretch of open water near the Keewatin bridge at this time of year, but not today. There’s a patch of white ice there that looks as if it melted during that mild spell in February, then refroze in March. 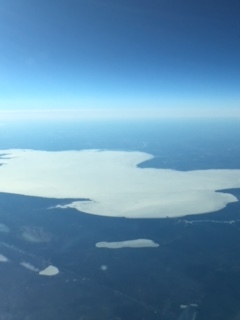 Further away from town, there are small patches of water where the current flows between the Barrier islands, but on the whole, the lake looks like a continuous sheet of solid blue ice. 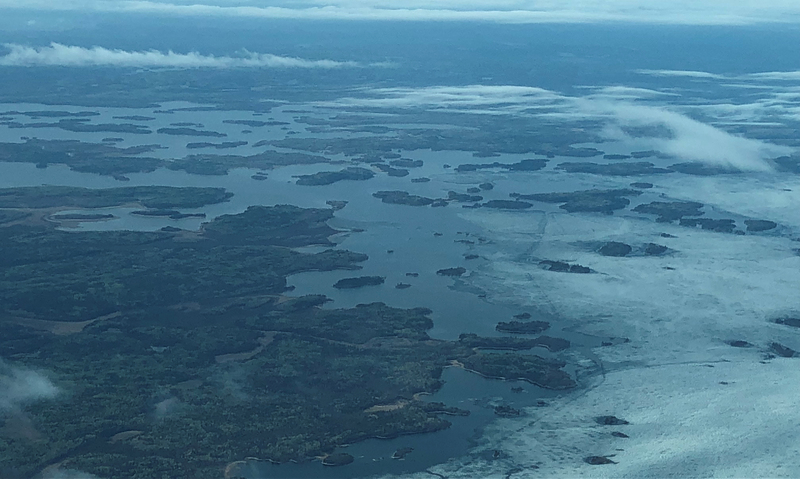 I was able to fly as far west as Clearwater Bay and I got a fairly good look at Shoal Lake. It’s all ice out that way, too. 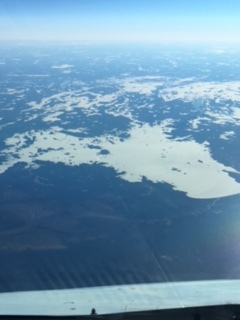 This picture shows a view looking west down Ptarmigan Bay and Clearwater Bay towards Shoal Lake. 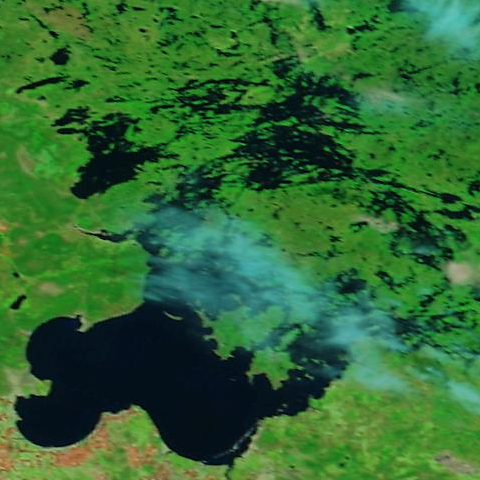 At the top right corner, you can make out Falcon Lake and West Hawk Lake. Milder temperatures are expected by the end of this week, but we’ve got some catching up to do.